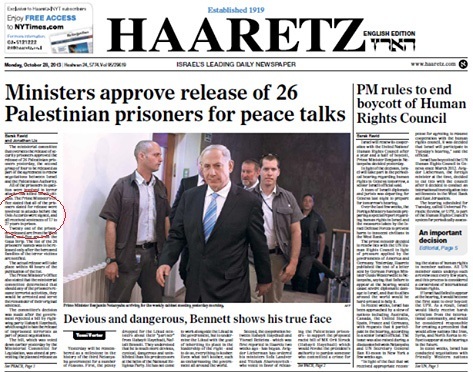 Ha’aretz‘s English print edition today runs a timely correction, prompted by CAMERA’s Israel office, of a page-one article which understated the sentences handed out to Palestinian prisoners slated to be released this week. 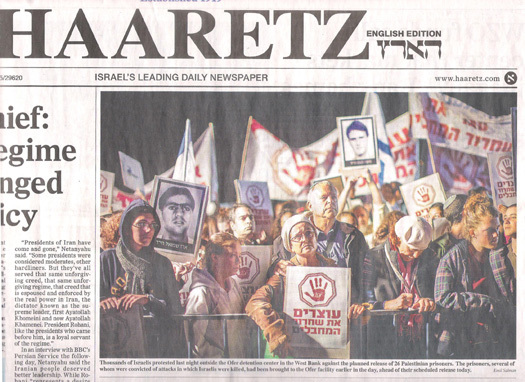 Unfortunately, though, today’s front page contains another error about the soon-to-be-released Palestinian prisoners, this time a photo caption which falsely states that “several were convicted of attacks in which Israelis were killed.” In fact, all were convicted of murder. The Prime Minister’s Office stated that all of the prisoners slated for release were involved in attacks before the Oslo Accords were signed, and all received sentences of between 17 and 27 years in prison. According to the Prime Minister’s Office, the released prisoners carried out the attacks for which they were imprisoned before the signing of the Oslo Accords and served 17 to 28 years in prison. For previous Ha’aretz corrections prompted by CAMERA and our Hebrew site Presspectiva, please see here. Thousands of Israelis protested last night outside the Ofer detention center in the West Bank against the planned release of 26 Palestinian prisoners. The prisoners, several of whom were convicted of attacks in which Israelis were killed, had been brought to the Ofer facility earlier in the day, ahead of their scheduled release today. The Israel Prison Service’s Hebrew list of the prisoners and their crimes confirms that all were in for murder. In addition, BBC Watch, an affiliate of CAMERA, has published an excellent detailed English list of the prisoners, their crimes, and the murder victims. 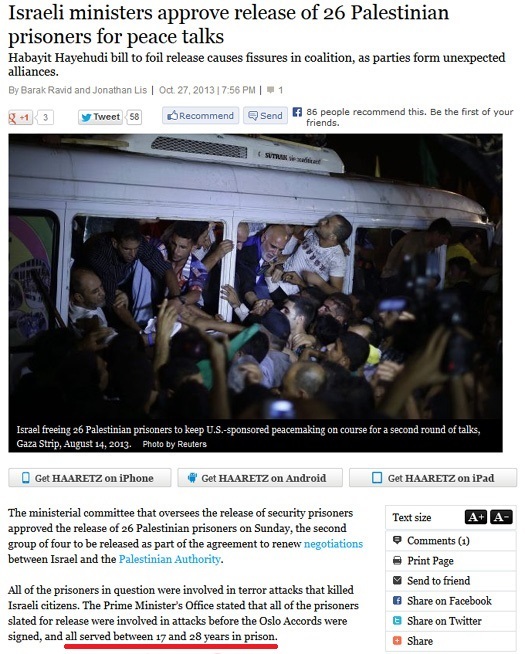 Unfortunately, Ha’aretz‘s erroneous photo caption is consistent with a history of mainstream media outlets downplaying or minimizing the brutal crimes of Palestinian prisoners. CAMERA has contacted Ha’aretz editors about the error. Stay tuned for news of a correction.